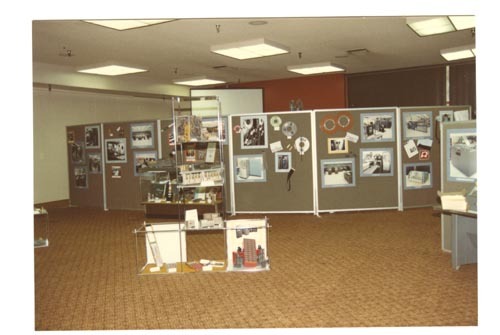 Color image of a Lawrence Livermore National Laboratory exhibit at the 1984 National Computer Conference.This exhibit consists of a group of partitions in the rear of room. The partitions have pictures and artifacts of various computer related subjects. In the center of the room is a standalone display of computer artifacts. Verso "NCC"